The intellect tries to know everything by cutting it open. Emotion knows things by inclusion. The Shivanga sadhana for women is designed to heighten your emotional intelligence, because it is a much easier way of doing things. Devotion is not about dissecting the Divine; it’s about dancing with the Divine, becoming one with it. If you want to dissect the Divine, you won't get anywhere with it. The best way is to embrace. When you embrace someone, you are also allowing yourself to be embraced. If you hold this sadhana as something sacred and simply give yourself to it, it will do miraculous things to you. 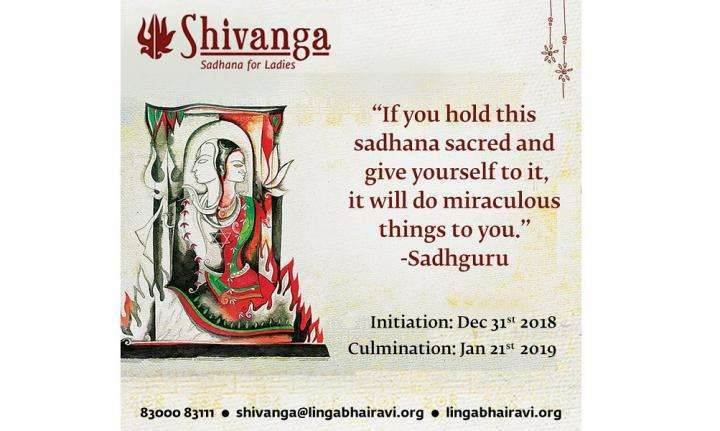 The Shivanga sadhana for women is an opportunity to bring forth devotion from within. The 21-day sadhana starts during early Uttarayana, when the sun's run shifts to the Northern Hemisphere, a time conducive for spiritual receptivity. The sadhana period culminates at the abode of Linga Bhairavi in Coimbatore, on the auspicious day of Thaipusam, which also marks the anniversary of the Devi's consecration. Through special practices, discipline and offerings, sadhakas receive the Grace of Devi. Whatever one's aspirations may be - health, wealth, passion, knowledge or transcendence - the Devi is the Ultimate Giver of all that and more. Isha Bhiksha offers the opportunity to contribute to Annadanam – the sacred offering of food – at the Isha Yoga Center.